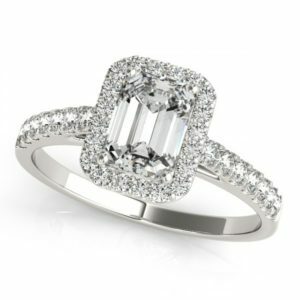 Diamond Halo Emerald-Cut Engagement Ring 18k White Gold (0.90ct) by Allurez. 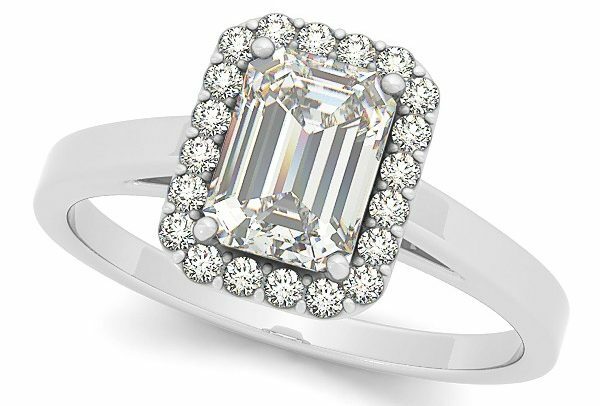 The engagement rings and wedding bands trendy in 2019 might look different than those popular a mere five years ago. Married celebrities have put the spotlight on the wide range of diamonds available beyond the traditional round shape, and yellow gold wedding jewelry is back as well. Below we’ve listed all the details about 2019’s biggest engagement ring trends. 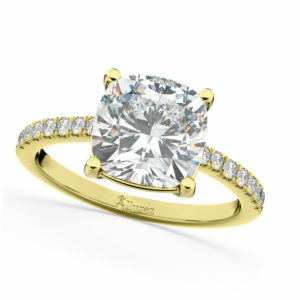 Cushion Cut Diamond Engagement Ring 14k Yellow Gold (2.25ct) by Allurez. Duchess of Sussex Meghan Markle, who got engaged in November 2017, is credited with helping to revive the trend of yellow gold engagement rings, which plays in part with the unconventional styles of millennial brides and grooms. In fact, Markle’s Asscher-cut diamond engagement ring and wedding band were both yellow gold. The Welsh gold wedding band was gifted to Markle by Queen Elizabeth, and Prince Harry purchased her three-stone engagement ring because of its link to his late mother Princess Diana’s jewelry collection. Prince Harry said there was no doubt he would get yellow gold for Markle’s band. 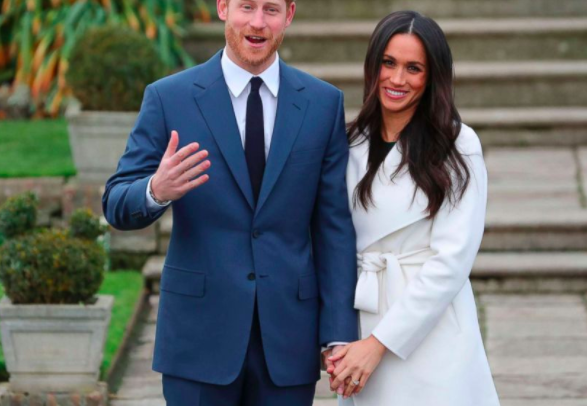 “The ring is obviously yellow gold because that’s [Meghan’s] favorite, and the main stone itself is sourced from Botswana and the little diamonds either side are from my mother’s jewelry collection to make sure that she’s with us on this crazy journey together,” Prince Harry said of the engagement ring during a BBC interview. 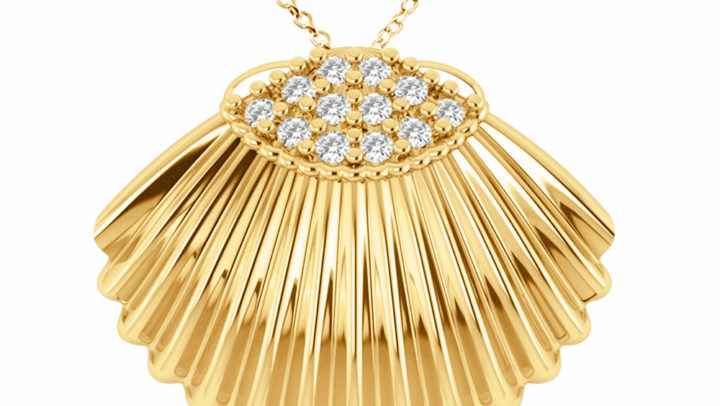 Yellow gold, once disparaged as “tacky” and old-fashioned, is influencing bridal trends again and Tanya Dukes, a runway stylist and jewelry expert, told Vox that she credits designers with also bringing back the yellow gold engagement ring trend. It’s been seen all over runways already. Kirsten Dunst, Miley Cyrus, and Mary-Kate Olsen have gold engagement rings too. Actress Jennifer Lawrence’s emerald-cut diamond ring from her art gallery director fiancé sit atop a thin gold band and model Hailey Bieber’s sparkler from singer Justin Bieber also features a diamond-encrusted gold band. 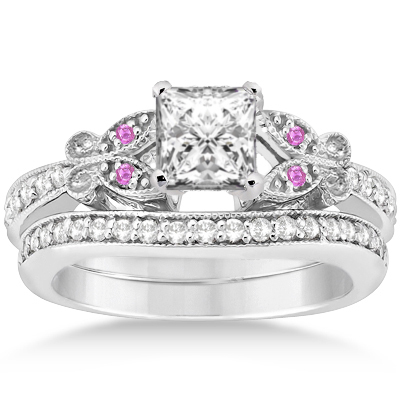 Cushion Cut Diamond Halo Engagement Ring w/ Accents 14k W. Gold 0.50ct by Allurez. 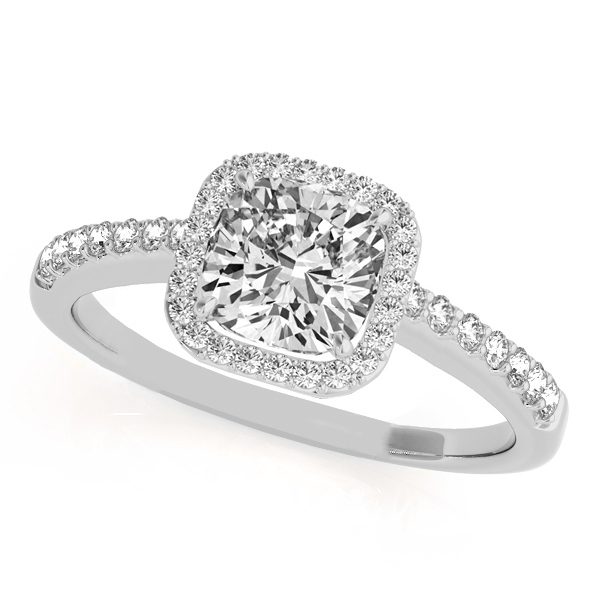 Halo engagement rings, which feature center stones encircled by several other stones, typically in circular or rectangular shapes, are also popular again in 2019. 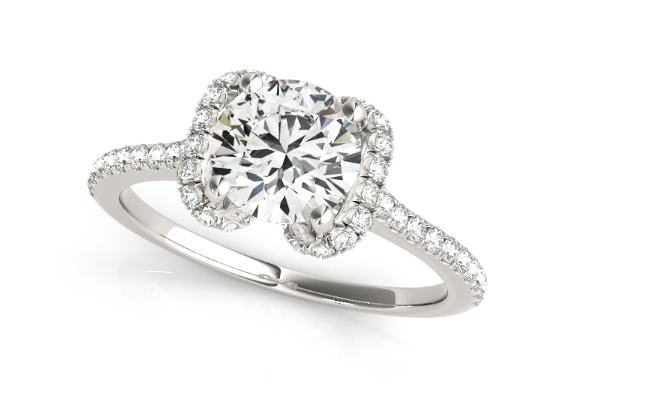 Highlighting and bringing attention to the center stone with a diamond halo is one way to distinguish your engagement ring from others, especially if you opt for a classic round diamond, which is the most popular and classic cut, Dukes told INSIDER. Author Katherine Schwarzenegger got engaged to actor Chris Pratt in January and the cushion-cut engagement ring that he proposed with was housed in a halo setting. 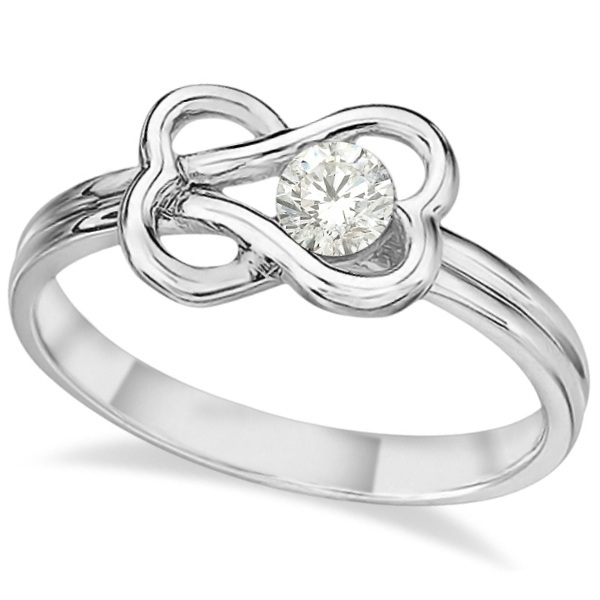 Bow-Inspired Halo Diamond Engagement Ring 14k White Gold (1.33ct) by Allurez. 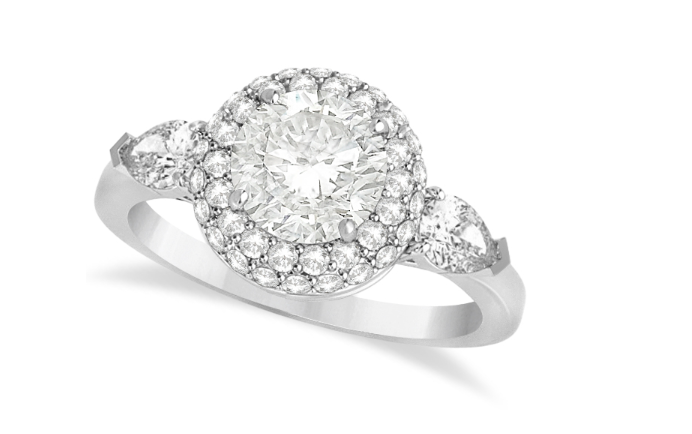 Many people are now opting for engagement rings in one-of-a-kind shapes or out of the box styles. For example singer Katy Perry got engaged to actor Orlando Bloom on Valentine’s Day and revealed her unique flower-shaped engagement ring with a photo on Instagram with the caption, “full bloom.” Her estimated 4-carat ring features a pink center diamond surrounded by eight smaller diamonds. 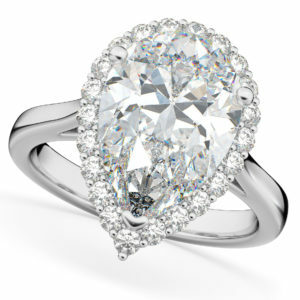 Pear shaped halo diamond engagement ring 14K white gold (4.69CT) by Allurez. Cardi B’s 8-carat pear-cut engagement ring from rapper Offset is in line with this trend and Lady Gaga’s engagement ring from former fiancé Taylor Kinney was a 6-carat heart-shaped stunner worth an estimated $400,000. Actress Priyanka Chopra’s engagement ring also features a fancy-cut diamond. Her now-husband, singer Nick Jonas, gifted her with a cushion-cut diamond surrounded by baguette diamonds when he popped the question. 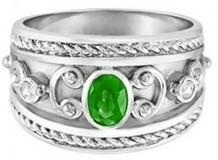 Pear and Round Cut Diamond Halo Engagement Ring 14k White Gold 1.70ct by Allurez. 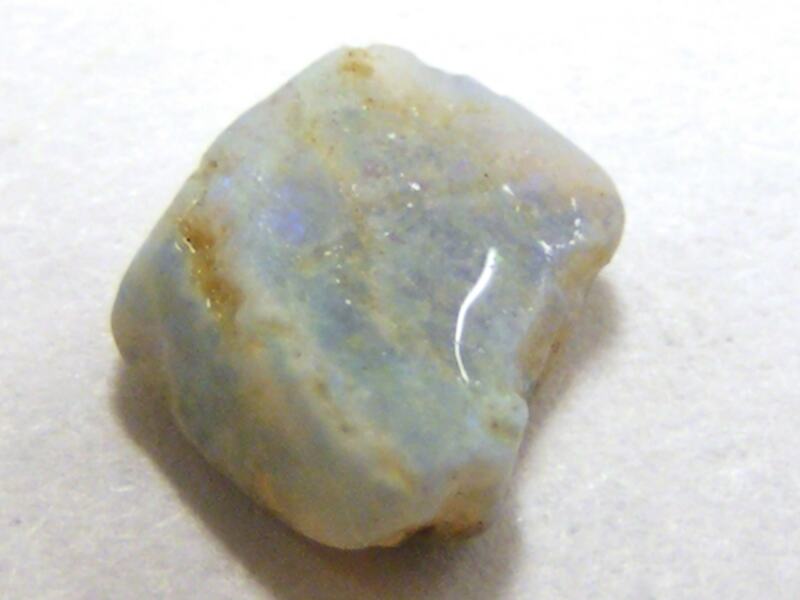 Lastly multi-stone engagement rings, which allow couples to be creative and mix diamonds of different shapes and sizes, are also very popular now. Meghan Markle has a three-stone diamond engagement ring and model Emily Ratajkowski has a two-stone ring that features a pear-shaped diamond and a princess-cut diamond.